PLANTATION, Fla., Mar. 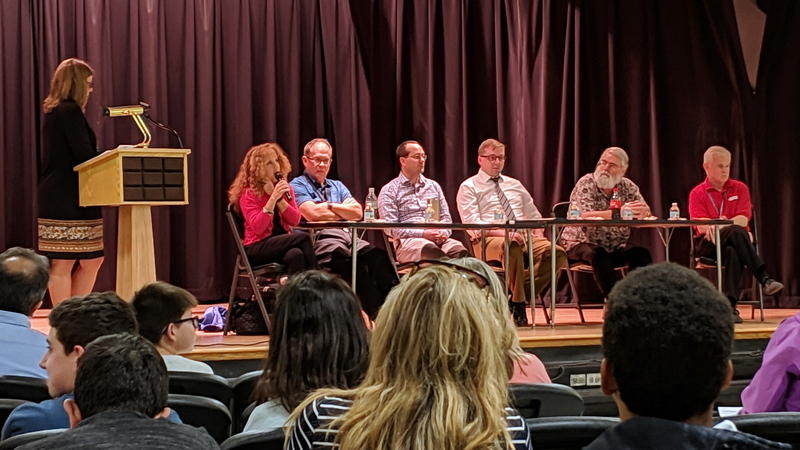 6, 2019 — Representatives from the University of Florida (UF) and Florida Atlantic University (FAU) met with more than 150 middle school students and parents in Broward County Public Schools (BCPS) last week to describe the exciting opportunities they are offering to graduates of Broward’s Elements of Mathematics: Foundations (EMF Math) program. EMF Math is an online curriculum that teaches pre-algebra through precalculus plus advanced topics in modern mathematics to students in grades 6-8. BCPS, the sixth largest public school district in the US, is in its fourth year of offering the program to bright students across a diverse mix of 31 middle schools. Schools and districts interested in licensing EMF Math should contact the Institute for Mathematics and Computer Science (IMACS) at https://www.EMFmath.com/schools. Many of the Broward’s EMF Math graduates are excelling as ninth graders in either Calculus I/II at UF through its dual enrollment program or in Advanced Placement Calculus at their local public high schools. L to R: Shari Stupp, BCPS; Shari Bush, BCPS; Bob McKinney, BCPS; Andreas VanDenend, UF; Brandon Case, UF; Dr. Stephen Locke, FAU; Iain Ferguson, EMF Math. Professor Stephen Locke, Associate Chairman of the Department of Mathematical Sciences at FAU, noted that EMF graduates can take dual enrollment classes during the summer at FAU. Some parents thought this might be an attractive option for students who want to take classes that UF doesn’t offer online or who would like to have a local professor. Parents in attendance were mainly seeking advice on navigating the uncertain road of high school and college coursework. Many of them found the presentations to be very informative and appreciated that these universities were already taking an interest in their middle school children. IMACS is currently offering schools and districts the opportunity to provide the first EMF Math course to an unlimited number of students at no cost. Teachers and administrators may request access by registering at https://www.EMFmath.com/schools. The Institute for Mathematics and Computer Science is an independent teaching and educational research institute with centers in South Florida, North Carolina, Missouri and Connecticut. Over 4,500 students from across the US and around the world attend local IMACS classes or study its online courses. For more information, visit https://www.imacs.org/. Cole Travers completed the EMF Math program during grades 6-8 through his public school district. 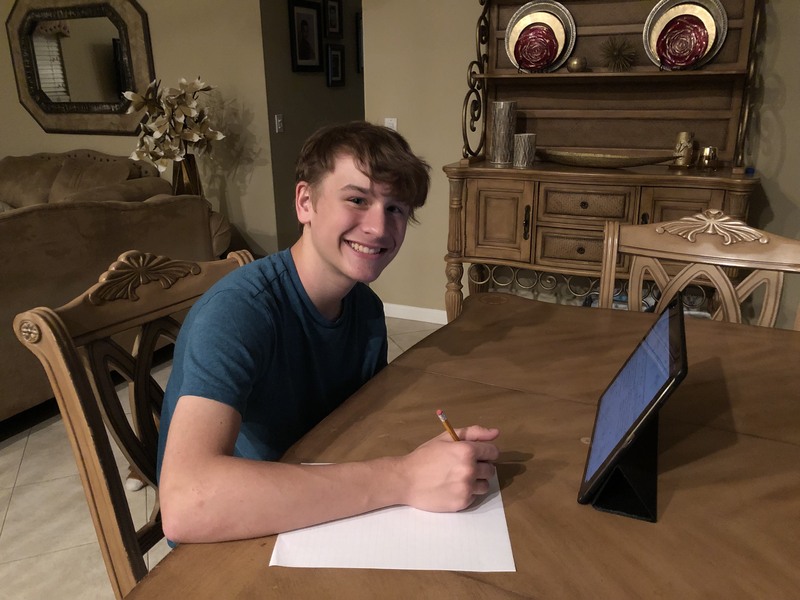 He wrote the following guest blog post in which he compares EMF with a traditional high school math class and explains why EMF was excellent preparation for college. Throughout my three years in EMF, I got to learn mathematics in the way that a mathematician understands it. Now that I am in 9th grade and in a traditional math class, I can compare this experience to my EMF experience. The main difference is that EMF focused on the why of math, while traditional classes focus on the how of math. In EMF, I was not just given statements of mathematical laws and properties and told to use them. EMF always made those formulas available, even during the major tests at the end of sections. Instead, I actually had to prove why they are true using logic. Proofs challenged my perspective on math and while they made math many times more difficult, they also made it many times more enjoyable and satisfying. My EMF experience made me want to keep learning the “why” behind the formulas and graphs that I see now in my traditional class, but, unfortunately, I don’t get to do that. To do well, I simply memorize a few formulas or graphs and apply them on homework, periodic quizzes, and unit tests. I can forget them as soon as we’re done with the unit, because they never come up again. At first, the more challenging part of a traditional class was doing a lot of calculations quickly. In EMF, quizzes and tests were untimed due to their difficulty and the unimportance of speed in true mathematics. Now I have one class period, or around 45 minutes, to finish a quiz or a test. At the beginning of the semester, using formulas two dozen times in 45 minutes was not something I was used to. But after a short time and a little practice, it got easier. I also now see that going the other direction — understanding concepts deeply when you’ve been taught to be fast — is much harder. Because I only have to memorize and apply formulas in my traditional class, the advanced skills that I learned in EMF — digging deep into a concept, solving problems creatively, and writing proofs — are not directly applicable right now. EMF certainly does not hurt in any way, and it will help in college math courses because they are more about actually understanding math. Plus the advanced material in EMF just made it really interesting. I probably would have been completely bored in math all through middle school if I had not been in EMF. Another difference is that in EMF, the ideas were interconnected and made sense as part of a bigger picture. As I learned new concepts in EMF, I also learned how they linked back to previous concepts. In order to solve EMF’s most complex problems, I usually had to bring old and new ideas together and come up with a new way to apply them. On a related point, how I learned to think in EMF actually helps me in classes other than math. The way EMF taught me to delve deeper and to layer new knowledge onto prior knowledge enabled me to do better than many of my peers in Biology Honors, for example. As with EMF, this is quite a challenging class and the material builds on itself. EMF helped me in ways bigger than mathematics by teaching me how to learn difficult subjects. I think I will be much better prepared to succeed in college because of EMF. Current EMF students should feel confident that they will do well in traditional high school math classes, even though these classes are very different from EMF. Understanding the material in high school math classes isn’t hard at all. Students just have to use a different approach, mainly memorization and application. I would encourage middle school students to enjoy EMF as much as they can because it is definitely the most interesting way to learn math that I have ever experienced. EMF Math is an online curriculum designed for talented middle school students. EMF covers Pre-Algebra, Algebra I, Algebra II, Geometry and Precalculus, plus advanced topics in modern mathematics. Would you like your public or private school to offer EMF? Share EMF school licensing information with your school’s math curriculum specialist. For EMF news, like EMF Math at facebook.com/emfmath. 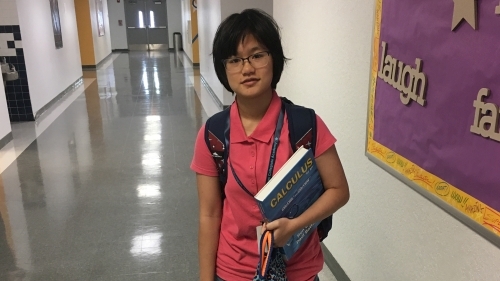 EMF Math graduate Isbella Yeung was accepted into Calculus 1 and Analytical Geometry at the University of Florida as a 9th grader. Isabella Yeung completed the EMF Math program during grades 6-8 through her public school district. She wrote the following guest blog post to share her memories of the program and advice for current and future EMF students. EMF truly is an amazing program. (No, I'm not saying this just because; I mean it with all my heart.) Looking back at the last three years, I am grateful for the opportunity to have participated in EMF. Unquestionably, I have grown from when I was a 6th grader just starting EMF. This rigorous program has expanded my knowledge about the world of mathematics, stimulated my brain cells, boosted my confidence level, and let me grow as a student. In fact, because of EMF and the support of my teachers and EMF professors, I scored 100% on the University of Florida Dual Enrollment math placement exam on my first try. Thanks to my score, I will be taking UF's Calculus 1 and Analytical Geometry course as a 9th grader. EMF has played a crucial role in my academic life and in my social life as well; I have created numerous everlasting memories with my best friend who was also in EMF at the same school. (As EMF students, we sat in classrooms with non-EMF students doing the usual accelerated math.) My friend and I gave each other encouragement when EMF exercises were difficult, and we amused each other with our imaginations during the regular classroom lessons. There is definitely a noticeable difference between EMF students and those who don't take EMF. My math teachers certainly noticed it. Whenever teachers would give my best friend and me a math test along with the rest of their class, we would score the highest in the class even though we didnâ€™t pay much attention to the regular lessons and barely studied for these tests. In 7th grade when my friend and I were in the Algebra 2 Honors classroom, we would finish our EMF work and then quietly make up crazy stories and comics to keep from getting bored by the regular lesson. We both got the top scores of our class on the end-of-course exam because of EMF. He got a near-perfect score, while I got a perfect score. The experience in 8th grade was similar. When the teacher would warn us about a Geometry quiz happening the next day, my friend and I would usually just skim through the regular textbook chapter for 10 minutes that night and obtain the highest marks in the class, either a 100% or just one question off. Thus, if you stay on schedule with EMF, the content definitely prepares you for school math finals or state math exams. But mostly, it's the way of critical thinking and logic skills that EMF instilled in me that has ensured my success on the tests and exams. Let me be frank; this course is not for the faint of heart. Sure, you might find it challenging, frustrating, and downright annoying at times, but this is all part of the growing and learning process. This is a program that forces you to look at concepts from multiple perspectives and drives you to think outside the box. It seriously takes your processing and logic skills to the next level! Because of this, my analytical skills have definitely been refined to a sharp point. As a word of advice to future and current EMF students: Know that there are no shortcuts in EMF. Work hard. In the end, the rewards you reap will surely be worth it. I have not and absolutely will not ever regret partaking in EMF. It has paved a plethora of new roads, ones that I will readily embark upon. I encourage you all to march on and face EMF head-on. Best of luck to all! 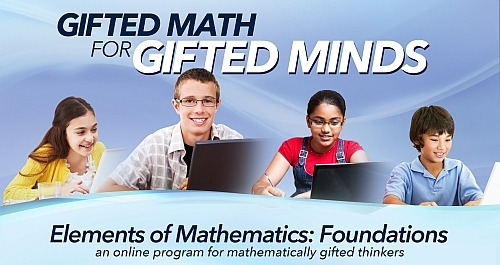 EMF Math is an online curriculum designed for talented middle school students. EMF covers Pre-Algebra, Algebra I, Algebra II, Geometry and Precalculus, plus advanced topics in modern mathematics. Would you like your public or private school to offer EMF? Share EMF school licensing information with your school’s math curriculum specialist. For EMF news, like EMF Math at www.facebook.com/emfmath. The International History Olympiad (IHO) is a biennial, week-long celebration of history attended by some of the best young history students from around the world, featuring numerous individual and team based competitions. At the recently concluded 3rd International History Olympiad (IHO) held in Berlin, Germany from July 14-22, 2018, EMF and eIMACS student, Shiva Oswal, won 5 Golds, 4 Silvers, and 2 Bronze medals, including the title of Overall Middle School Olympiad Champion. The 2018 International History Olympiad was attended by over 200 History students with more than 30 global affiliations. 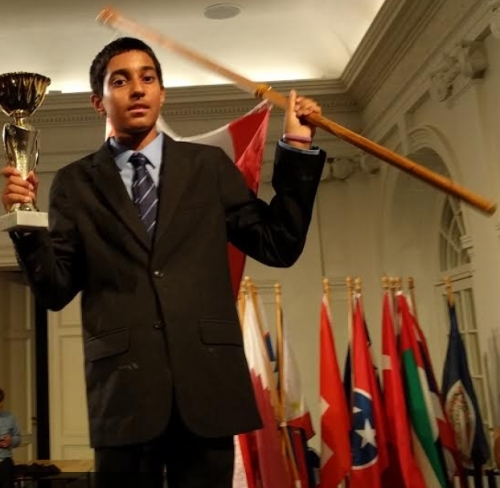 Oswal was part of Team California that was the 2018 Medal Table Champion securing an impressive overall count of 40 medals. Oswal contributed over 25% to Team California's overall medal tally. Team India placed 2nd and Team Canada came in 3rd with 23 medals each. The 2018 IHO closing ceremony was held at the Charlottenburg Palace in Berlin, Germany. "It was great to see Shiva proudly hold the California flag on more than ten occasions," said his dad, Vikas. Learn more about EMF and eIMACS online courses for talented students. 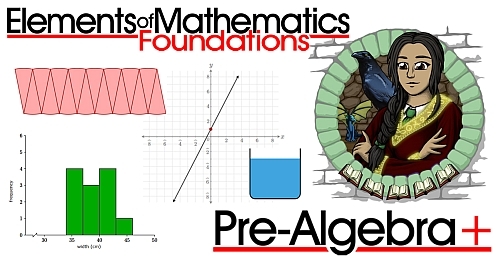 EMF covers Pre-Algebra through Precalculus plus advanced topics in modern mathematics. eIMACS offers university-level courses in Mathematical Logic and Computer Science, including a College Board-approved course leading to the AP Computer Science A exam. CELEBRATION SALE! Course 1 only $19.95 for new families through August 31, 2018. The Institute for Mathematics and Computer Science (IMACS) is thrilled to announce that the Elements of Mathematics: Foundations (EMF) online program for talented middle school students is now complete with the release of the 18th and final EMF course, Precalculus Coda. Precalculus Coda brings together topics from earlier EMF courses and expands on them with an extensive study of vectors in the real number plane and space, linear transformations (including orthogonal mappings), and matrices and their application in solving systems of equations. Upon successful completion of the EMF program, students will have covered all national and state math standards for pre-algebra through precalculus but from an entirely modern mathematical approach. In addition, they will have enjoyed thorough introductions to college-level topics such as Abstract Algebra, Logic, Set Theory, Number Theory and Topology, and be well-prepared to excel in a college-level Calculus course. Mathematically talented students typically master school math with little effort. As a result, they tend to become bored with and disengaged from math if limited to traditional curriclum. They may also fail to develop the mental resiliency and study skills that come with having to work hard at math problems designed for their ability level. The EMF curriculum is designed specifically to engage young, gifted thinkers in ways typically reserved for university math majors. It is useful to distinguish the two ways in which EMF is college-level: (1) the sophisticated use of logic and reasoning via proofs, and (2) the introduction of modern areas of mathematics such as Topology. EMF incorporates all the concepts from a traditional curriculum but uses a logic and proof-based approach not usually entrusted to students until college. Talented middle school students who are intellectually mature and motivated can benefit from this more sophisticated approach; it fosters the development of creative thinking skills that are not easily replaced by computer processing power as algebraic manipulation skills already have. In other words, EMF prepares students with skills for the future, not skills of the past. EMF's incorporation of exciting topics in modern mathematics—topics ignored by traditional school math—makes it far more interesting and intellectually engaging. These topics represent areas of active research as opposed to traditional school math subjects that were understood completely by the late 17th century. The idea of cutting off a child’s education in literature, history or science at the 17th century is ludicrous. The same applies to mathematics. For children in many parts of the US and around the world, EMF now fulfills the promise of opening up access to a comprehensive, unified, proof-based approach to modern mathematics. IMACS certainly believes in the value of talented and dedicated teachers, but we also believe that lack of access to such teachers has unfairly limited for too many bright students the right to be challenged at their ability level on the way to achieving their full potential in mathematics. We aim to change that with EMF. In celebration of EMF's completion, tuition for the first course has been dropped to $19.95 (regularly $59.95) for a limited time. Through August 31, 2018, new families save 67% on the first EMF course or 25% on a bundle of all 18 courses. Visit EMFmath.com to learn more and enroll. Did you know that numerous districts, schools and after-school programs license EMF? In fact, the first cohort of EMF students in Broward County Public Schools, Florida completed the program last year. As a result, many of them will be enrolling in Calculus as 9th graders this fall. If you would like to see EMF offered in your school, share the EMFmath.com/schools website with the relevant decision-makers in your district. Comments Off on EMF Math For Talented Middle School Students is Complete! The following is an excerpt from Geometry: Incidence and Transformations, the first of three Geometry courses in the self-paced Elements of Mathematics: Foundations (EMF) series. EMF covers Pre-Algebra through Precalculus, plus several university-level topics, with the depth and sophisitication needed to challenge and mathematically talented children. Limited Time Offer: The first EMF course is available at 25% off regular tuition for students who enroll on or before October 31, 2017. Learn more at www.EMFmath.com. In this course and the next our main focus is on Euclidean geometry. As you have undoubtedly noticed, in the preceding courses we have quite frequently talked about, considered, and even worked with a wide variety of geometrical concepts. But we have been relying on common knowledge and your intuitive understanding of such things; we have only rarely hinted at the formal underpinnings of this very important and pervasive area of mathematics. 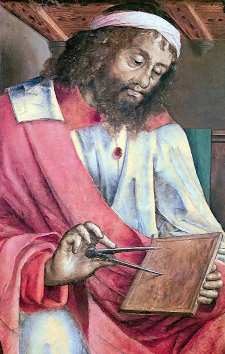 The history of the study of geometry is very long and honorable, springing out of humanity’s attempts to describe mathematically the forms, shapes, and patterns seen in the real world. Roughly speaking, our intended plan of study in this course is as follows: Each of us has a store of experiences with real objects, their forms, and their shapes. These experiences will be refined as we draw pictures of objects, observe specially constructed models of objects, and think about experiments that could be performed with these objects. As we sharpen our experiences with physical objects, we will describe corresponding geometric objects (such as points, lines, and planes), and decide what properties these geometric objects should have if they are to be mathematical replicas of the real objects. Of course, geometric objects, like all other mathematical objects, are abstractions, so the only role that can be played by our drawings and experiments with physical points, lines, and planes is that of serving as a guide to the properties that should be ascribed to their abstract geometric counterparts. The properties we ascribe to the geometric objects will be called agreements. 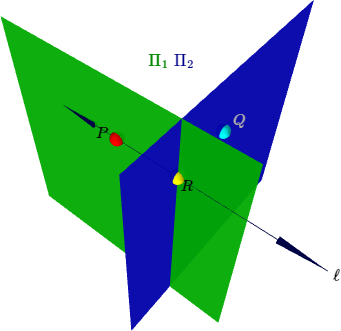 That is, we will agree to accept a certain property about geometric points and lines, say, because our experience strongly suggests that physical points and lines have that property. Of course, agreements in geometry, as in real life, have consequences. This then is the activity of geometry: to find out what the consequences of the basic agreements are. In other words, we shall agree that the geometric objects we wish to study have certain basic properties. We shall then deduce that geometric objects with these properties must also have certain other properties. We will discover these new properties, not by looking at the objects (remember, geometric objects are abstractions!) but by thinking about them. We will express our thoughts in arguments of the following general form: Since we have accepted our basic agreements, then we must also accept that such and such is the case. But then we are constrained to accept that thus and so, etc. Finally we examine these new properties in order to decide whether they too are compatible with our experience of physical objects. In this way, Euclidean geometry becomes the mathematics of the shapes and forms of the world around us. To learn more about the Elements of Mathematics: Foundations (EMF) program and how to gauge whether it would be a good fit for your mathematically talented child, review detailed information on the main EMF website, have your child take the FREE online aptitude test, read blog posts here and here, read reviews, and watch our video. 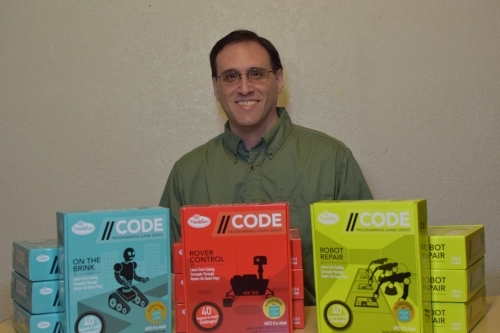 The IMACS Blog reconnects with alumnus Mark Engelberg who recently released three new coding games through ThinkFun and Target. (Win an autographed copy of one of Mark's new games!) Mark's passion for computer science, math and logic led him to an award-winning career in puzzle and game design. He is also an active speaker in the Clojure programming language community. 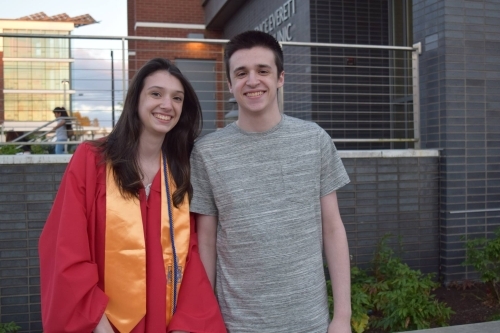 In this post, Mark talks with IMACS about what it was like to be a homeschool dad to two amazingly talented children who are now accomplished young adults in their own right. 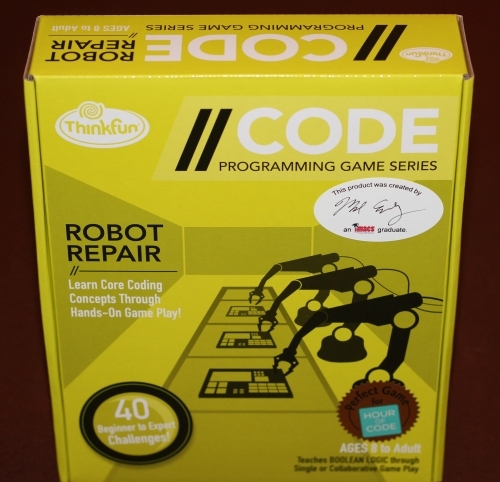 Mark’s new //CODE Programming Game Series is available through Target. First, tell us about your new ThinkFun games. Two years ago, I invented a programming puzzle game for ThinkFun called Code Master. Code Master was a commercial and award-winning success, so ThinkFun asked me to develop a new line of puzzle games, where each game would highlight a specific underlying principle of computer science. The new line of games is called the //CODE Programming Game Series. To design the games, I started from a list of concepts I wanted players to encounter, and kept trying out ideas and tinkering with the rules until I felt I had a combination of mechanisms that covered those concepts and was fun to play. The first game in the series, On the Brink, is an introduction to procedural abstraction — the idea that we're not just writing programs to solve a one-off task, we're building components that solve multiple instances of an underlying problem, and then using those components to build higher-level components, and so on. The second game, Rover Control, focuses on the essential skill of stepping through programs in your head and visualizing the outcome, particularly with flow control constructs like if-then-else statements, while loops and for loops. The third game, Robot Repair, is all about Boolean logic. When developing Robot Repair, I leaned heavily on the material that I learned as a child in IMACS' Advanced Mathematical Logic courses. I think students in your Logic courses are really going to enjoy Robot Repair. Like their predecessor, Code Master, all three of the new games are "unplugged" computer science board games that come with a book of puzzles for solo or cooperative gameplay. You are also a parent of two gifted children who are now ages 19 and 17. About how old were Alex and Molly when you first suspected that they were gifted? What were the signs? I was a stay-at-home dad, and when Alex and Molly were toddlers, I taught them to read and write and gave them daily math lessons. Honestly, I mostly did those things to keep myself from getting bored; it was fun for me to feed their intellectual curiosity. My wife did the same with the kids when she was home from work. That was just our parenting style. We wanted the kids to have the opportunity to learn these core skills as soon as they were capable, and the easiest way to achieve that was to throw a lot of educational activities at them early, just to see what would stick. As it turned out, more of it stuck than we expected! I didn't really have much to compare their development to until the day I went to Alex's kindergarten orientation. As the teacher explained what the students would be doing in the coming year, it dawned on me that my kids had already done those things. I realized that I had inadvertently given my kids a big jumpstart, and what I had been doing was working, so I might as well keep doing it. And that's how I ended up deciding to homeschool my kids. Because I homeschooled my kids, the label "gifted" didn't really come into play. I never needed to get them tested, or prove anything to a school official. But it was clear to me that they had the capacity to learn faster than what our school system provides, so I set out to do my best to keep them challenged and allow them to fully develop their individual talents. 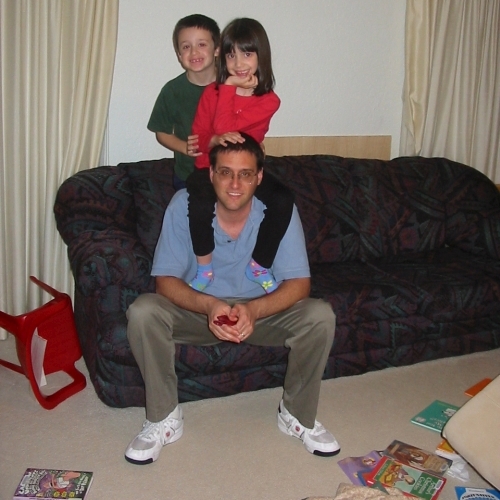 When Mark realized that his young children had already learned everything that was to be covered in kindergarten, he decided to homeschool them. How did you feel when you knew for certain that they were gifted? It felt like a tremendous responsibility to help them achieve their full potential, even more so because I was choosing to take on that responsibility myself rather than relying on the school system. If things didn't work out, I would have no one to blame but myself. It was a lot of pressure. I didn't really doubt my capability to teach them, but I knew it would be an enormous undertaking, one that would require the bulk of my time and attention for nearly 20 years. It was well worth it — I'm so proud of the young adults they've become — but I'm relieved to have reached the point where that responsibility is behind me rather than in front of me. As you looked into ways to meet their educational needs, what did you discover? One pleasant surprise was realizing that it isn't necessary to be an expert in everything in order to meet your kids' educational needs. In many cases, it's more about playing the role of an advocate, connecting them up with the right resources. I would track down private teachers, public school classes, homeschool co-op classes, other parents, books, videos, and websites for the areas I was less equipped to handle. I did my part for the homeschooling community by serving as a teacher of math and computer science for many other talented kids whose parents were not as adept at those particular subjects. What were some of the programs, opportunities or approaches that you found helpful in making the most of their talents and interests? One of the things that was really important to me was to make sure my kids had a strong foundation in math and computer science. Fortunately, I have the advantage that I learned the IMACS curriculum when I was in middle school and high school. This made it easy for me to teach these subjects because I'd already experienced first-hand what a top-tier math and CS education looks like. To duplicate that experience for my kids, I simply taught them using the same materials and techniques that I had learned at IMACS and in college. Those resources played a big role in giving me the confidence to homeschool. What were some of the benefits and challenges of homeschooling? How did you deal with the challenges? One of the biggest challenges of homeschooling is that it takes effort to find a community to be a part of. We are fortunate that here, where we live in Seattle, there is a robust homeschooling community and we were able to find a group that fit our personalities and make many dear, lifelong friends. Once we found the right community for us, those rich social interactions became one of the biggest benefits of homeschooling. Our weekly park days remain some of my most cherished memories. Another big challenge is that, even though my kids are close together in age, they were far enough apart that I couldn't do the same lessons with them. I always felt like I was struggling to give each of them the level of individual attention I wanted to give them. My solution was to make certain parts of the day relatively structured and leave the other parts of the day flexible so that I only needed to schedule the structured parts. For example, I might be doing structured math lessons with one child while the other was doing creative writing or watching an educational video, and then switch. The kids are alright! Alex has been working full-time as a professional software engineer since he turned 16. At 17, Molly just entered college as a junior and plans to study theater stage management. What were some other challenges you faced in parenting gifted children, and how did you deal with those? Gifted children can be wildly asymmetric in their abilities, and wildly different from one another in terms of their talents and interests. It was a constant challenge to avoid getting impatient when one of my children would struggle with a concept that came naturally to the other. I had to keep reminding myself that it was totally normal for them to have different strengths and weaknesses. How did being a gifted adult who was once a gifted child affect your educational and non-educational parenting choices? This was especially helpful when my kids' interests dovetailed with my own. My son, for instance, developed a keen interest in programming, and thanks to my own background, I knew exactly what to do to support him in that interest. When my kids' interests and abilities diverged from mine, it was a lot tougher, and I ended up doing what any parent would do … seeking out people and resources that could help my kids develop their talents. What are your fondest memories of raising Alex and Molly? Probably my fondest memories are the many times we played board games together over the years. For those moments, instead of having a parent/child relationship, or a teacher/student relationship, we were just people playing games together and enjoying each other's company. I feel like at those moments, I really gained some insight into their character, and got a glimpse of what they would be like as adults. 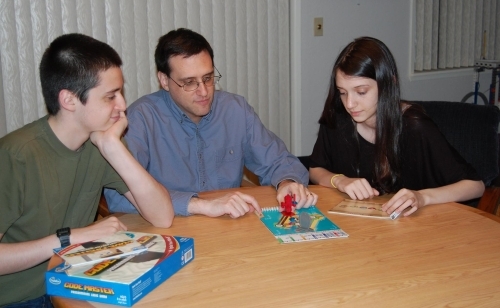 Mark, Alex and Molly enjoy a family game of Code Master. What are your hopes for them in the future? My hope has always been for them to be good, caring, compassionate, independent, happy adults. The good news is … they already are. I'm done! Woohoo! Robot Repair was inspired by Mark's study of the IMACS’ Advanced Mathematical Logic curriculum. Parents must register their child to take either the EMF Aptitude Test (ages 10-14, approximately) or the eIMACS Aptitude Test (ages 14-18, approximately). On the aptitude test online registration form, type "IMACS Blog" in the box for "How did you hear about us?" or "How did you hear about IMACS?". Take the EMF or eIMACS Aptitude Test for your chance to win an autographed copy of Robot Repair. To learn more about the curricula that Mark studied as a middle and high school student, visit www.EMFmath.com and www.eIMACS.com. A typical pre-algebra curriculum is designed to promote computational or procedural fluency. Unfortunately, that is rarely enough to engage gifted minds. Pre-Algebra Plus, an online course within the Elements of Mathematics: Foundations program, offers gifted students a better option. Pre-Algebra Plus was created specifically for the way gifted minds work. Course material invites students to play with numbers, patterns, and puzzles. Unnecessary repetition is traded away for deep exploration of complex ideas. This approach appeals to both traditionally "mathy" kids and those with untapped mathematical talent. Instead of telling students what the rules are, Pre-Algebra Plus takes students on the journey of discovering the rules through observation, conjecture, and reasoning. As one parent put it, Pre-Algebra Plus teaches math from the inside out. Pre-Algebra Plus introduces basic logic and proof techniques. Logic and creativity complement each other naturally in the study of genuine mathematics. Creative thinking helps students leverage what they know and observe into new (to them) ideas about mathematical concepts. Logical thinking helps order and cement those ideas into cohesive arguments and conclusions. Pre-Algebra Plus is hard! The course explores several university-level topics not normally studied until college. For a mathematically talented child, being challenged is a joy. After all, what's the point of a Formula One racecar if you only get to drive it on a straightaway, even at accelerated speeds? Pre-Algebra Plus is individually-paced and available online 24/7, allowing each student to work on the course when convenient and go at the pace that works best for his or her learning. Is your mathematically talented child ready for pre-algebra? Does he or she need a flexible, online course designed for the gifted thinkers? Pre-Algebra Plus is that course. Visit the Pre-Algebra Plus website to learn more about course content and enrollment. Special Offer: Pre-Algebra Plus is offered to new students at a 33% discount to regular price. Visit www.EMFmath.com for details. For mathematically talented children, acceleration is a commonly used approach to address their need to be challenged. While acceleration can save gifted math students from unnecessary repetition, by definition acceleration cannot go deeper than the standard curriculum, and deeper is what many of these students desperately need. Mathematically talented students deserve to be inspired by engaging curriculum, not merely less bored. Educators know this and are seeking better solutions that offer gifted math students the opportunity to study genuine mathematics with the depth and sophistication that match how their gifted minds work. Of these twelve characteristics, acceleration can make maximum use out of only 1, 2 and 7 to deliver a learning experience that is somewhat better than no accommodation at all. The other nine characteristics require an approach that is fundamentally different from the standard curriculum, which is designed to work with typical students. 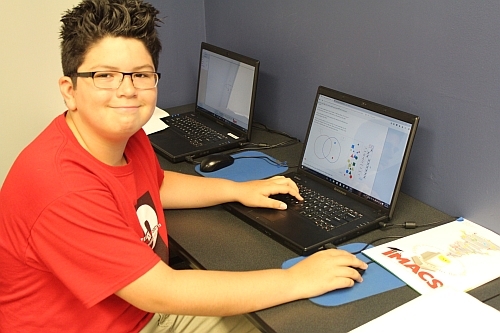 Corbin Diaz, a rising eighth grader in the EMF program, is excited about learning advanced mathematics. Elements of Mathematics: Foundations (EMF) provides that fundamentally different approach. Developed by a team of mathematicians who teach gifted children, EMF was designed from scratch to leverage all 12 characteristics. The result is a curriculum that allows talented students to immerse themselves in the study of mathematics where their unique way of thinking fits naturally and is an enormous advantage to learning at the highest levels. One of the most important aspects of EMF is that it allows students to experience the excitement and satisfaction of intellectual discovery. The standard curriculum, accelerated or not, tends to present the final result as a given to be accepted blindly. By contrast EMF emphasizes the path leading up to the result and teaches some basic techniques of logic used to get there. EMF students are guided through thought-provoking exercises that lead them to keen observations. Then using logical and creative thinking to analyze and synthesize this information, students are able to arrive at the result themselves. This approach creates a much deeper, intuitive understanding of mathematics and is strongly aligned with how gifted children learn, especially the nine characteristics that acceleration ignores. Acceleration has been an acceptable compromise solution for gifted math students and their educators for a long time. Many gifted students, however, have long needed and deserve better. They need to learn mathematics in a way that embraces their endless curiosity and unique way of looking at the world. They need a curriculum designed specifically for the way their minds work. That curriculum is EMF. is excited about learning advanced mathematics. 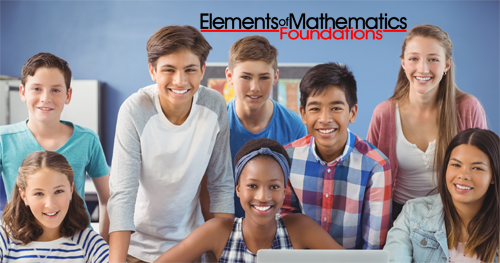 Broward County Public Schools (BCPS) is increasing the number of middle school students enrolled in the Elements of Mathematics: Foundations (EMF) curriculum from 40 to several hundred students over the next several years. EMF was created for mathematically talented children by the Institute for Mathematics and Computer Science (IMACS), an independent teaching and educational research institute based in South Florida. EMF is an online curriculum that teaches pre-algebra through pre-calculus plus several more advanced subjects in just three years. Graduates will be ready to study Advanced Placement calculus in ninth grade. The program also happens to cover Florida's math standards for sixth, seventh and eighth grades, which allows BCPS to offer EMF as a complete math curriculum for the District’s middle school students. "BCPS wants our students to have the very best preparation in mathematical thinking and complex problem-solving," explains Guy Barmoha, Director of the Math, Science, and Gifted Department for BCPS. "The EMF pilot was a success, and the self-study, online format makes it relatively easy to scale up, even for a large school district like ours." Schools and districts interested in using EMF should contact IMACS directly. 100% of respondents said that their child's focus, study skills, and ability to analyze complex problems have improved since beginning EMF. 92% believe that EMF has made their child more ready for high school and college mathematics. 92% report that their child enjoys doing EMF and finds EMF challenging. Nearly 90% of last year's BCPS/EMF class of sixth graders elected to continue in seventh grade. Wendy Diaz, whose son will continue, has seen EMF ignite a passion for learning within him: "Corbin comes home excited to see what is next in EMF. He absolutely wants to excel at everything now that he has seen how much fun it can be to learn." More than 70 incoming sixth graders hope to qualify for the program this fall. Matt and Amy Kaufman, whose daughter Olivia will continue in the program, understand why: "EMF provides an avenue for children to stretch themselves mathematically. The feeling of accomplishment our daughter has received bolstered her confidence and has her ready for whatever comes her way." With EMF, talented children can study college-level math such as Number Theory, Abstract Algebra and Probability & Statistics. "EMF teaches very advanced mathematical concepts, yet the presentation and problem sets are designed in a way that allows middle school kids to learn the material online," noted Maxim Chekmasov, who holds a Ph.D. in mathematics and whose son Andrei is in the program. "BCPS has done an admirable job with its current gifted math program," said IMACS president Terry Kaufman. "Still, there are some kids who need an even greater challenge. I appreciate the trust that the BCPS has put in IMACS to provide a world-class education for its students and am thrilled that many more will benefit from EMF in the coming years." The Institute for Mathematics and Computer Science (IMACS) is an independent teaching and educational research institute with centers in South Florida, North Carolina, St. Louis, and Connecticut. Over 4,500 students from across the US and around the world attend local IMACS classes or study its online courses. For more information, visit imacs.org or elementsofmathematics.com. Broward County Public Schools (BCPS) is the sixth largest public school system in the United States and the second largest in the state of Florida. BCPS is Florida's first fully accredited school system since 1962. BCPS has over 265,000 students and approximately 175,000 adult students in 238 schools, centers and technical colleges, and 103 charter schools. BCPS serves a diverse student population. Students are from 208 different countries and speak 181 different languages. For more information about BCPS, visit browardschools.com.